Patients who choose Facelift Surgery desire a more youthful and defined neckline, jawline, and cheekbones. In addition, they want to bypass visible scars that result from surgical incisions. Other outcomes of Facelift incisions may include hair loss around the temples, an unnatural hairline and an altered shape of the tragus (the cartilage that covers the ear canal). For years, patients have enthusiastically aspired to look younger through Cosmetic Surgery. The Traditional “Facelift” has enabled both men and women to eradicate ten years from their noticeable age by tightening loose skin, and reinvigorating the face’s youthful resilience and contours. Although many patients still prefer this conservative method, others frequently seek out innovative, minimally invasive techniques sooner that provide similar benefits, which means no extended surgical procedure and the extended recovery time. Dr. Oleh Slupchynskyj, a distinguished New York-based Facial Plastic Surgeon, developed the minimally invasive Facelifting technique, the SLUPlift™, which produces the same long lasting results without the need for extensive surgery, large incisions, General Anesthesia and a long recovery. Patients who opt to have a Traditional Facelift usually wait until the signs of aging are obvious to condone the procedure. Some conventional Facelift recipients may wait until they are 65 or older to take on the process; although the signs of a more youthful appearance will become more evident, the patient also risks more complications due to both the trauma involved in the technique and the patient’s advanced age. Patients with less obvious aging often select the SLUPlift™ procedure, as it is both less traumatic and more effective in those instances. Even patients in their late 50s or early 60s can see immediate improvement after the SLUPlift™ Surgery. During a Traditional Facelift procedure, the Facelift Surgeon creates an incision starting from the hairline at the temple, curving around the ear, and ending on the opposite side. In some cases, the Facelift Surgeon may also create an incision under the chin to tighten up loose skin around the neck and jowls. When the Facelift Surgeon makes the incision he (or she) will pull the skin away from the underlying fat and muscle and hold in place. The tissue layer directly under the skin, referred to as the Superficial Musculoaponeurotic System (SMAS), is the target area in a Facelift procedure. The Facelift Surgeon will fold back the SMAS layer until the underlying tissue is pulled taut, then replace the skin layer and remove any excess skin. Sutures or surgical glue are then used to close the incision. The procedure typically takes 2 to 4 hours and requires the patient to be under heavier General Anesthesia. Dr. Slupchynskyj’s patented SLUPlift™ achieves several of the same goals as a Traditional Facelift, but with a more efficient, minimally invasive technique. In place of the long incision around the entire ear used in a traditional procedure, the SLUPlift™ uses a small incision around the earlobe. Dr. Slupchynskyj inserts tools in that smaller incision to locate the SMAS and the platysma muscle (found in the lower jaw and upper chest). Dr. Slupchynskyj then inserts sutures through those tissues and pulls them tight. The sutures are tied off behind the earlobe, the excess skin is removed and the incision is sealed with micro-sutures. The SLUPlift™ procedure usually lasts anywhere from 1 to perhaps 2 hours. The results bring a tighter and more youthful appearance to the face and neck, with a much smaller incision, shorter time in surgery, no General Anesthesia and a quicker recovery. Similar to Traditional Facelifts, the SLUPlift™ tightens the skin around the lower face and neck. The excess skin is carefully removed and the results can last up to 10 years for the majority of patients; however, the SLUPlift™ technique has numerous advantages over the traditional methods. 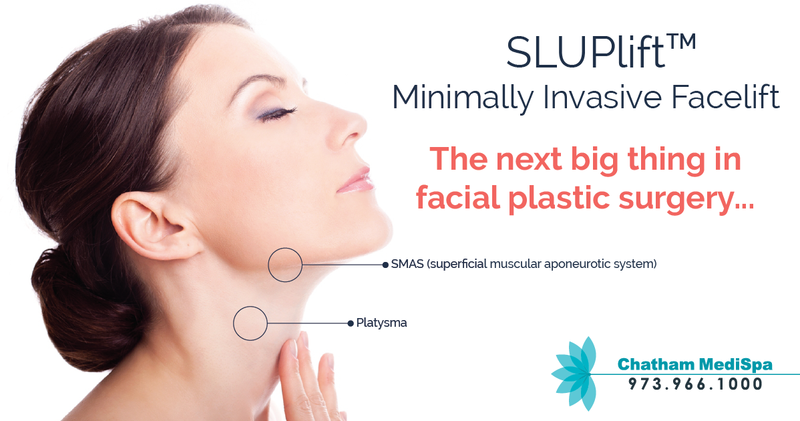 One of the major advantages of the SLUPlift™ procedure is the decreased incision size. The smaller incision exposes the patient to less trauma, allows for less scarring and decreases the post-operative recovery period. The SLUPlift™ procedure is minimally invasive, which benefits both the surgeon and the patients. Dr. Slupchynskyj’s process has the patient rest comfortably during the operation under Local Anesthetic, without the need for the patient to endure General Anesthesia. The fast, simple procedure also enables the patient to experience a much lower occurrence of swelling, bleeding, infection or any other post-operative trauma, with immediate results. Patients typically recover in a week or less and return to their daily lives in 5 to 10 days. Another advantage of the SLUPlift™ procedure is that it allows for as much or as little adjustment to the face as the patient requires. This technique offers Dr. Slupchynskyj some much-needed freedom in adjusting the tension of the skin to suit the patient’s desired outcome. The added freedom enables him to work on the lower face and neck region, including the jowls and the skin around the platysma muscle, while also removing or rearranging the surrounding fatty tissue (a process referred to as “Submental Liposuction”). The smaller incision around the earlobe enables the Facelift Surgeon to adjust the skin and underlying tissue with “microneedles” and sutures, rather than with cruder tools that may cause trauma during or after the procedure. The SLUPlift™ technique achieves the optimum results for patients that require mild to moderate wrinkle removal, with significantly less post-operative swelling and bleeding. This aspect of the technique uses a “bloodless” incision that identifies the SMAS and platysma muscle, without the need to remove or relocate the overlying skin. Since the incision is significantly smaller and much of the work takes place below the skin surface, the patient experiences much fewer problems during recovery. In a Traditional Facelift procedure, the patient receives General Anesthesia, either intravenously or through inhalation. The patient is unconscious and, consequently, requires strict monitoring by the surgeon, the Anesthesiologist and the surgical support staff to ensure that he or she does not suffer any ill effects during surgery. Since the Anesthesia can paralyze the muscles responsible for breathing, the patient receives an intubation tube down his (or her) throat that feeds oxygen into the lungs. Patients can experience breathing problems, vomit in the lungs, low blood pressure, and other problems while under General Anesthesia. The SLUPlift™ procedure uses Local Anesthesia to the affected areas of the lower face. The patient does not under any paralysis and can respond to both verbal and touch cues from the surgeon. The patient also does not require any breathing assistance during the procedure and experiences only a slightly lower level of consciousness than normal. The administration of Local Anesthesia also does not require an Anesthesiologist to monitor the patient’s level of responsiveness or the addition of more numbing agents to keep the patient under during the procedure. The decreased need for Anesthesia also allows for a faster post-operative recovery period. Patients experience the key advantage to the SLUPlift™ procedure after the operation, as decreased recovery times than those experienced by patients who have the Traditional Facelift Surgery. While the Traditional Facelift procedure can last up to 4 hours, the SLUPlift™ procedure lasts only 60 to 90 minutes. The smaller incision and lack of General Anesthesia makes for a faster and easier experience for both surgeon and patient. While most patients can require up to 2 weeks or more for immediate recovery from a Traditional Facelift, whereas patients who undergo the SLUPlift™ procedure often return to work within a week. Since the patient does not receive General Anesthesia, the recovery process begins almost immediately following the operation, while the minimal scarring and bruising allow the patient to see the results of the SLUPlift™ within a few days. The longer incision used in most Traditional Facelift procedures can lead to the appearance of unattractive scars and hair loss near the incision sites. Additionally, some patients who undergo a Traditional Facelift may see a deformity in the earlobe after the Facelift Surgeon reattaches the loose skin. This deformity, referred to as “Pixie Ear”, is often a highly noticeable sign that the patient had a Facelift. The SLUPlift™ procedure leaves the patient with much less of a noticeable scar and no hair loss. Since the incision does not detach the earlobe from the face, patients are not at risk of having a “Pixie Ear” following surgery. Many patients who have undergone the SLUPlift™ procedure have submitted Before and After Photos that reveal the extraordinary improvement in the lower face and jaw areas. Many of these patients have also corresponded with Dr. Slupchynskyj and his staff about the benefits they have experienced after the surgery. 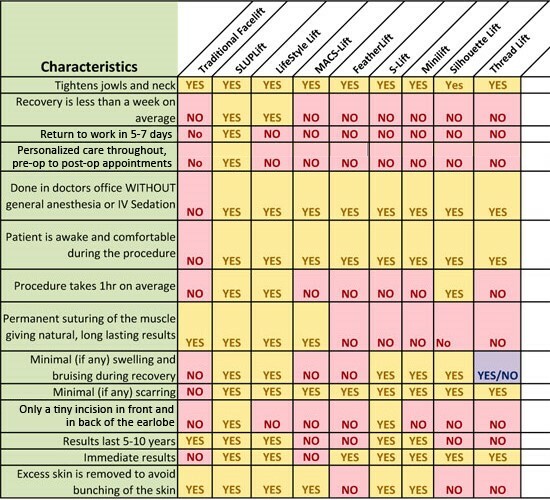 Read some of the patient reviews. The philosophy behind the SLUPlift™ is simply “less is more”. The procedure requires much less time, staff and effort than the conventional Facelift Surgery, but delivers results comparable to, and sometimes exceeding, those found in patients who had a Traditional Facelift. Smaller incisions, less trauma and faster recovery times allow patients to see immediate, long-lasting results from the SLUPlift™. New York City Top Facial Plastic Surgeon Dr. Oleh Slupchynskyj has techniques that not only hide the scars from surgical incisions, but also leave the area around the incisions with a pleasing and natural appearance. A Facelift procedure can require either a traditional technique, a limited incision or a Neck Lift, based on the patient’s degree of aging, skin laxity. An incision for a Traditional Facelift begins at the hairline near the temples, moves around the ear flap and stops at the lower scalp. A limited incision begins at the temples and continues around the ear, but can also include incisions in less visible spaces, such as the upper lip or under the lower eyelids. The Neck Lift incision begins at the temples, goes around the outer ear and ends in the lower scalp. Dr. Slupchynskyj re-drapes the skin to smooth out the wrinkles, and then uses sutures to close the incision. In some cases, Dr. Slupchynskyj may remove or redistribute fat in the face, jowls and neck to create a smoother appearance. Dr. Slupchynskyj, who specializes in Facelifting, will show patients a series of Before and After actual patient photos that focus on the mid-face, jawline and neckline regions. While these photos will show the effectiveness of a specific technique, they can also serve to hide the consequences of poor placement or incision technique. Patients should be skeptical of a Facelift Surgeon who does not share photos of patients with their hair pulled away from the incision areas. When a Facelift Surgeon fails to consider the repercussions of the incisions, patients might be disappointed the results and might have to consider Revision Facelift Surgery to fix the issues. Lack of hair around the temples. Visible incisions in front of the ear flap. Visible incisions behind the ear flap. Long, attached earlobes (known as “Pixie Ear”). “Webbed” skin behind the ear flap. Except for the loss of “sideburn” hair these issues, require Revision Facelift Surgery to correct. The loss of “sideburn” hair requires a hair transplant or other hair replacement procedures to correct. During Traditional Facelift procedures, the patient lays back while the surgeon marks the incision sites. Dr. Slupchynskyj prefers to mark the sites while the patient is in a seated position, thus presenting a more accurate determination of how the sites will reflect changes caused by gravity. The hair is not trimmed to safeguard no hair loss from inadvertently cutting hair follicles during the surgery. The hair is carefully parted and secured using clips to enable maximum preservation of all hair. Additionally, the hair tuft (sideburn) is never included in the incision. This ensures that the temple hair or hair tuft is never pulled back, resulting in noticeable bald areas. A result of a poor incision occurs when a Facelift Surgeon removes too much skin at the earlobe and reattaches it to the jawline. After surgery, the earlobe becomes stretched, causing in a condition referred to as “Pixie Ear”. A useful technique to prevent Pixie Ear is placing an incision near the earlobe prior to suturing major Facelift incisions. This incision enables a Facelift Surgeon to reconstruct the earlobe at close to its proximate position. During Traditional Facelift procedures, the incision moves around the ear and up to the hairline; however, a lower incision line can avert considerable scarring and many of the after effects of this technique. 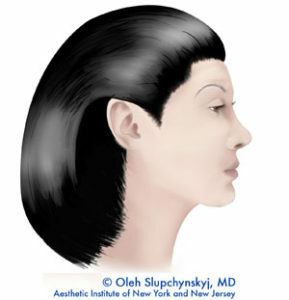 Rather than a vertical incision that moves up the hairline, Dr. Slupchynskyj makes a horizontal incision at the edge of the sideburn tuft and reaches no higher than the top of the ear. The horizontal incision cuts only near the hair follicles, which prevents hair loss caused by unintentional cutting of the hair follicles. Dr. Slupchynskyj sees numerous male patients who are as interested as women in enhancing their appearance. The presence of facial hair in males can create issues with the final results of any Facelift procedure, as well as with any post-surgical scarring. Other Facelift Surgeons may choose to make an incision behind the tragus and pull the beard onto the tragus, all the way up to the region in front of the top of the helix (the outer “shell” at the top of the ear). However, Dr. Slupchynskyj never performs a post-tragal incision, as this will always result in a clear indication of a Facelift when the tragus is pulled forward from scar contracture. A calamitous outcome of poor Facelift incisions is that the resulting skin tension makes it very problematic to correct such problems right away. The Revision Facelift Surgery cannot be performed until the skin has relaxed to a specific extent. The incisions for the revision procedure must conceal scarring from the original procedure, in addition to masking the scarring from the follow-up. Hair loss is typically remedied with hair plugs or transplants, but these procedures also cannot be completed until after the skin has relaxed. While the focus of the Facelift process is to enhance the appearance of the neck, jaw and mid-face areas, patients should also be mindful of the cosmetic prognosis of the incision sites. The scarring, hair loss and unnatural appearance of the ears after a poor Facelift can undo most of the effort and preparation that went into the procedure. Fig. 1.) A small “U” shaped incision is made around the earlobe. Fig. 2.) A “bloodless” dissection is made until the muscles of the face – SMAS and Platysma are identified. Fig. 3.) A “permanent” suture is placed into the playsma and SMAS muscle. Fig. 4.) The sutures are then tied close to the earlobe tightening the SMAS and platysma and therefore the jowl and neck area. Fig. 5.) Excess skin is trimmed and the skin is closed using a microsuture technique. Fig. 6.) A final result shows improvement in the jaw and neck line.